Woke up to the tip-tapping of rain on the tent, but before we could even think about the day to come, the sun was already out and hot, like a baked potato. I gave my briefing of the things to come while everyone ate their Master-choco cereal and tried to catch bugs. Some went as far as to set up ‘wanna-bee traps’ to lure in our breakfast stealers. After the briefing, everyone immediately set about doing their jobs, no questions asked. The first dive of the day was very successful. We decided to re-establish a baseline along the ship so to ensure accuracy in the drawing and in the future sketches that were to be made. The first divers in, Bente and Andrew completed the outline within one dive. The second dive consisted of Martin and Kostas drawing in details and refining the outline. Finally with the third dive, Christian and Liv went around the wreck taking measurements, primarily of the bow and stern sections. At the end of the dive, after the divers flopped aboard deck, a mini-briefing was held where we could discuss what had happened underwater. As for the ‘land-based underwater archaeology’, the FPL 77 wreck has still been worked on continuously throughout the days. Sarah and I completed one side of the plank tagged ‘100,’ which was removed yesterday and today Sarah and Andrew completed that plank. 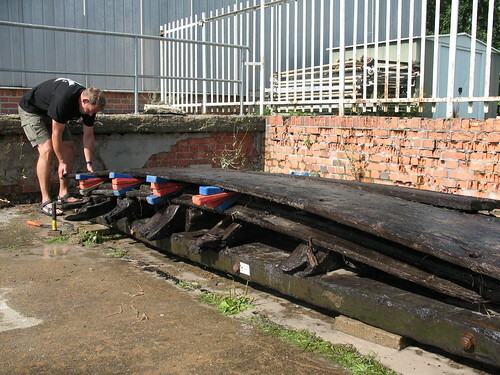 An extensive legend was completed with various types of trenail holes, trenail holes with iron nails, wooden plugs … etc. Furthermore, we have continued to have both those on FPL duty and camp duty give the wreck a nice luscious wash done as often as possible. With such hot days and the baking sun helping our tans, the wreck needs more and more water so it does not dry up. Then again, so do we – back to diving. Jens Auer removing outer planks of FPL 77 "4am wreck"
Another sunny day in Prerow, Germany, started at 7 am with breakfast and briefing of the upcoming day. The aim of the day was to tag the rest of the wreck’s timbers, identify the tags on the drawings that were made the previous days and to make a few corrections on the site plan drawing. The first two dives went perfect and almost everything was completed, so that our dive instructor Jens Auer and diver Konstantinos Alexiou only had to make a few corrections and then start doing tomorrows tasks of cleaning and start drawing. Unfortunately, Jens found out that everything was distorted because our two base lines were too far away from the wreck. That means that the outline of the wreck was wrong and thereby also the frames and the planks that were drawn in today and yesterday. We therefore need to set up two additional baselines tomorrow and start all over again. But then again we are here to learn so it is good that we were ahead of our plan. At the end of the day the waves became huge and supervisor Marja-Liisa Grue and diver Martin Lonergan reported about waves at a height of two and a half meters (they are still walking from side to side). In the camp the work continued on the FPL 77 wreck where the upmost layer were taken off the wreck so further registration could continue. New elements and planks were tagged and pins in different colours were put in to point out fastenings. A thunder and lightning storm woke everybody in their tents at 04’42 and we presumed the worst but it was not to be. After a large amount of heavy rain it cleared up and it became a beautiful day. First up for diving were Jens and Andrew and they carried out photography of the wreck site and working operation in an amazing visibility up to twenty meters. Next to dive are Sarah and Marja. This perfect visibility gave them the opportunity to start the tagging of the various part of the wreck and to draw some of its interesting features. The last dive of the day was carried out by Cate and Christian. 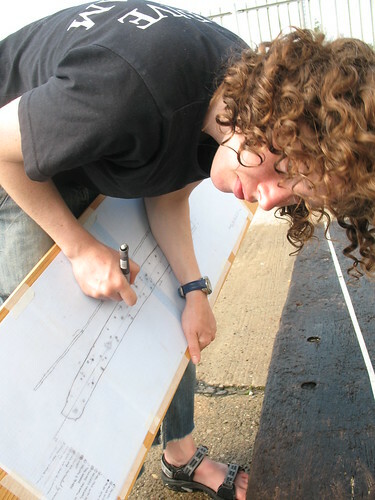 They continued on with the tagging of the wreck and made great progress towards completing the drawing of the wreck. Meanwhile at the campsite Bente, Jens and Martin finished the drawing plan of the ‘4 a.m. wreck’ (FPL 77). They also managed to survey ‘4 a.m. wreck’ (FPL 77) with a total station before the divers arrive back from a hard day’s work. The day started off with a small amount of pessimism about the weather. The wind never really died, but we were fortunate enough to not have any rain. Our first dive was cut short due to multiple simultaneous calls of nature, but the remaining dives seemed to be having a competition for the longest dive. The winner of this “competition” came in with a dive of 2 hours 18 minutes! This was despite having equipment problems in the middle of the dive. Aiding the divers in their competition was the fact that the main purpose of their dives was to draw more of the ship, a task which allowed the divers to focus completely on their work while remaining very relaxed. Not all of the focus is on diving, however. 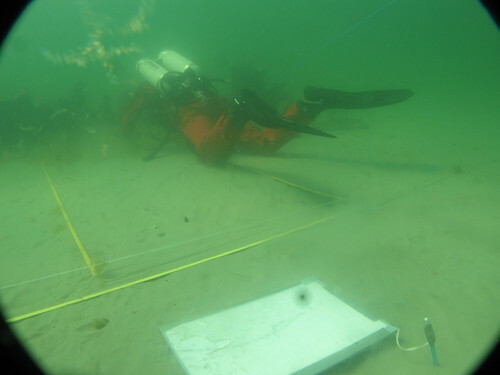 With the ship fragment FPL 77, affectionately known among the students here as the 4 AM Wreck, everyone had work to do even when they were on the surface. People seemed to be in especially good spirits when informed that we would be able to take the ship apart in order to fully document it. Drawing has begun and is coming along quite nicely. Having the task today of being the site director I had planned an ambitious day of diving. 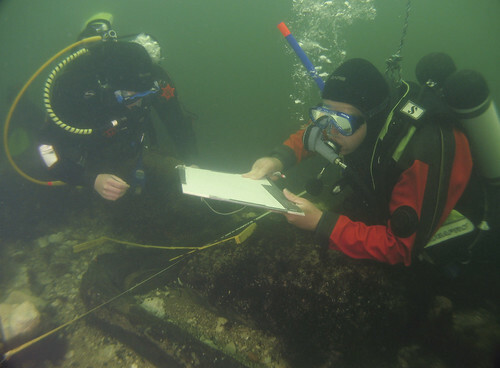 The main task of the divers was to establish a recording grid and maybe start recording. With An early start I wanted to do four dive and if possible a fifth dive could be squeezed in. This plan slid even before the first dive. After a successful morning briefing, we made practice set up of the grid in the camp, to make sure it was understood by everyone. Arriving to the boat moored approximately three kilometers down the beach from the site, I discovered that the fuel tank had been removed the day before, after diving. This resulted in a rather late start of the first dive. After retrieving fuel for the boat the first dive team got in the water about 11 o clock. I was part of the second dive together with Bente. My dry suit wasn’t nearly as dry as the name promises. My left leg was completely soaked shortly after the beginning of the dive. Wearing the backplate, my only buoyancy control was my suit. When surfacing I couldn’t keep air in the suit since it was constantly escaping from my neck seal, this meant that I couldn’t stay at the surface with out kicking hard. Despite these problems we got the grid right and started on the drawing. The third dive went well and the outline of the wreck was recorded on the drawing. After a chaotic start we got the things running and managed to reach the goal set for the day’s dive. The class of 2007/2008 has just returned from a fieldschool on the Swedish island Gotland. 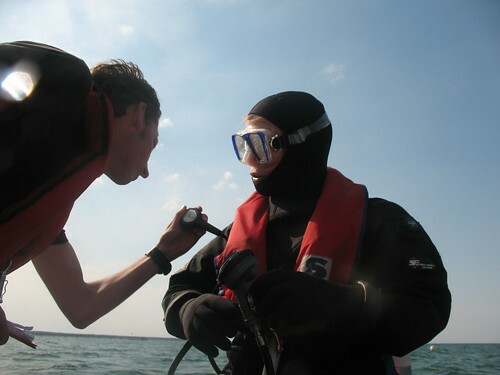 Invited by the HUMA Project, students of the maritime Archaeology Programme participated in a diver survey just north of Visby. The HUMA project focuses on the underwater cultural heritage of Gotland. In 2008 fieldwork concentrated on known locations connected with the loss of the Danish-Lübeck fleet on the west coast of Gotland in 1566. Based at the wonderful Krusmyntagård, SDU students and staff spent three weeks surveying an area of seabed at Brusviken. The aim of the survey was to produce a map of artifact distribution on the site. 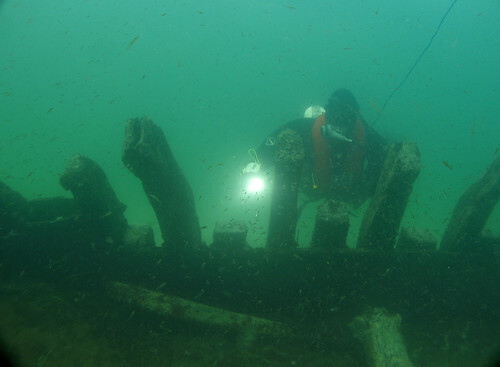 In addition we recorded parts of the stern section of a vessel which had been located by local divers. More fieldwork pictures can be found on our Flickr page. Further information on the project and the fieldwork session is available on the HUMA project webpage. A report on the fieldwork results is currently being produced and will be posted here when available.